Mix the wet ingredients in a bowl and the dry ingredients in a separate bowl. 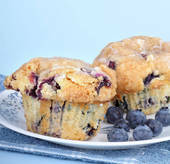 Do not add blueberries until the end. Add the wet ingredients to the dry ingredients and mix well (electric mixer preferred). Fold in blueberries. Pour batter in muffin foils (can use nonstick cooking spray) about 75% full. Cook at 350 degree for about 30 minutes or until toothpick comes out clean from center.